Hi-Point offers affordably-priced semi-automatic handguns in a range of the most popular calibers. The model JHP .45 ACP Hi-Point pistol is built on a larger frame to assure a firm, comfortable grip and exceptional recoil control. Its polymer frame has been given a durable, attractive easy-grip finish and includes high-impact grips. 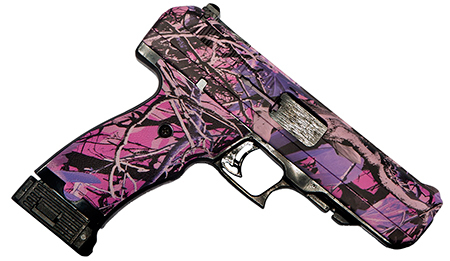 All Hi-Point pistols features last round lock open and 3-dot, fully adjustable sights. Other extras on the Model JHP include a quick on-off thumb safety and a free extra rear peep sight and trigger lock. 100% American-made, parts and assembly. +P rated.